Oakland housing developer Rick Holliday says his new factory-built, multi-unit housing projects will help address the housing shortage. Rick Holliday and Larry Pace at Factory_OS. As Rick Holliday strolled through his massive warehouse on Mare Island, he recalled the moment when he realized he had to change his business. The Oakland-based developer has spent much of his career building workforce and affordable housing for middle- and low-income residents in the Bay Area, but the skyrocketing cost of construction was making the job increasingly difficult. Just a few years ago, construction costs were about $500 a square foot in the region for multi-unit projects, he said. "Today, it's about $700, and rising," he added. "Costs have been going up about 1 percent a month." Holliday noted that, ironically, the region's extreme housing shortage is primarily to blame for the soaring costs of construction. Like many other people, construction workers - carpenters, plumbers, electricians - can't afford to buy or rent homes in the urban Bay Area, so they increasingly have to drive long distances from outlying communities to get to construction sites in Oakland, Berkeley, and San Francisco. And their mind-numbing commutes, slogging through miles of traffic, often slows down construction jobs. It's not uncommon for workers to stand around at job sites waiting for materials or other members of the crew to show up or wanting to get off early to beat the afternoon rush hour. "The work day has been shrinking; productivity is shrinking," Holliday said of the housing construction industry in the Bay Area. "It's the only thing in our economy where productivity is going down." Holliday said that because construction costs represent 70 percent of the cost of each housing unit, he realized he had to change the equation. So, he decided to create a modular construction facility, where he would build each housing unit in a factory, and then ship it to the actual job site for final assembly. Holliday estimates he can build multi-unit housing 40 percent faster in a factory, while saving at least 20 percent on costs. He eventually hopes to cut construction costs in half. A Berkeley resident whose housing business, Holliday Development, is headquartered in Oakland, Holliday originally wanted to convert an old warehouse in West Oakland, but when that didn't work out, he found a huge space on Mare Island in Vallejo. He purchased a sprawling 256,000-square-foot facility, where submarines were once built during World War II, and it provides him and his business partner Larry Pace of Cannon Contructors North with plenty of space to construct dozens of modular units at a time. 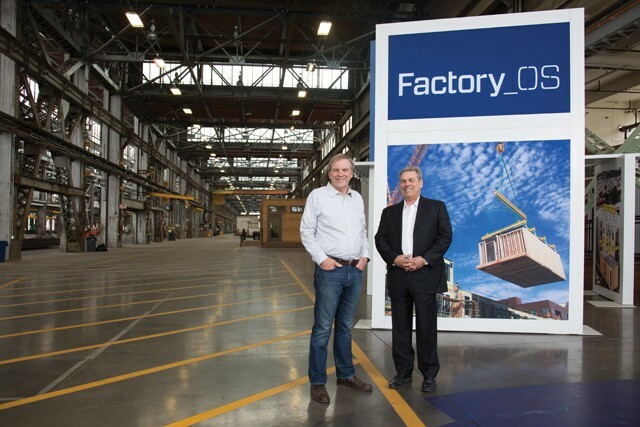 Holliday and Pace plan to begin building housing at the facility - called Factory_OS - this month and intend to construct units for at least four multifamily housing projects in the East Bay. One of those sites is the Emeryville property where Holliday's housing projects have been burned down twice by arsonists. By rebuilding the project in his factory, and then quickly assembling it onsite, Holliday will be able to reduce the chances that an arsonist will torch the project again. As he walked through the Mare Island warehouse, Holliday likened it to an assembly-line-style automobile factory, with numerous workstations where plant workers will build and assemble different aspects of each housing unit, including the kitchen, bathroom, plumbing, and electrical systems. Each unit, ranging in size from a studio to a three-bedroom, will be modular and stackable and will move down the assembly line until completion. After the units for a project are done, Factory_OS will send them by truck, rail, or ship to the job site for final assembly. The plant also employs union workers - all from the carpenters' union - who will do all the work, including the plumbing and electrical. "We see it as the next evolution - at least for this part of the industry," said Jay Bradshaw, director of organizing for the Northern California Carpenters Regional Council. Bradshaw also compared Factory_OS to an auto plant where all the workers belong to the same union. "It's not going to be broken down by 'I'm an in the engine-installers union or the windshield-wipers' union,' " he said. Some other members of the construction trades, however, have raised objections to Holliday's modular housing factory, saying they oppose the idea of carpenters doing the work traditionally performed by plumbers, electricians, and other unions. But Bradshaw noted that the modular factory is just getting off the ground and is unlikely to dominate the housing construction industry anytime soon. "Carpenters have never tried to fight new technology," he said. "When the industry evolves, we try to adapt to it." Also, there will still be plenty of housing construction jobs available for other unions in the Bay Area for the foreseeable future. In fact, there's a construction worker shortage right now because of all the housing and office towers being built and the lack of qualified people to do the jobs. In addition, there is no immediate need to use modular housing for luxury housing projects, because high construction costs can be passed on to wealthy renters and buyers. Holliday plans to build mostly workforce and affordable units at the factory - in order to meet the extreme demand in the Bay Area for reasonably priced housing. Factory O_S is also building with wood, so the units will be used for multi-family projects of up to a maximum of seven stories in height. One of his first customers is Google, which has commissioned about 300 units of modular workforce housing from Factory_OS. "We have these costs that are just insane," Holliday said, referring to out-of-control rents and home prices in the region. "It's about what are we going to do to attack the costs of housing? Oakland needs thousands of these units. San Francisco needs thousands of these units." Holliday is not the only developer who has switched to modular. RAD Urban, which is building several housing projects in Oakland, is also using modular - although it's working with steel rather than wood. That means Rad Urban has the ability to construct high-rises with its modular units. Its warehouse is in Lathrop, and the employees there are also represented by the carpenters' union, Bradshaw said. Both the Rad Urban factory and Factory_OS are drawing their workforces from areas near the factories, where homes are cheaper so that employees don't have to commute long distances. Both plants also pay union wages and benefits. "These are good, local, middle-class jobs," Bradshaw said. For Oakland, Holliday plans to build the first modular project - 110 units - from Factory_OS for a site he owns at 532 Union St., near the West Oakland BART station. He also plans to build 300 to 400 units, including low-cost housing for formerly homeless people, at the old Phoenix Ironworks warehouse in West Oakland. And he's building a mixed-income project near El Cerrito BART with affordable housing developer Bridge Housing, a nonprofit for which he serves on the board of directors. He also intends to partner with cities like Oakland to build inexpensive micro-modular units for formerly homeless people. "There is so much work to do for people in the lower tier" of the income scale, he said. This report was originally published by our sister publication, Oakland Magazine.